We are so proud to be offering an expanded second edition of this comprehensive source of practical information which answers all questions and concerns you might have about the role triglycerides play in our health and the natural means of controlling them. Complete satisfaction guarantee or your money back -- at any time, with no questions asked! You will get all the crucial insights, in easy-to-read and follow format, of ALL of our success at helping people lower their elevated blood triglycerides and live longer, healthier life. You will become more analytical and capable of judging standard medical treatments; therefore, be able to make an informed health decision and choose the path you want to take in order to bring your triglycerides down to healthy levels – with drugs or, hopefully, without them. If your levels of blood triglycerides are above 150 mg/dL, or 1.7 mmol/L this book is for you. So get ready! With the program that has so dramatically helped hundreds of clients with elevated blood triglycerides at our Canadian office, you can make it happen. "I am pleased to participate in bringing to public awareness a message that could change lives: You can bring your triglycerides down and, therefore, reduce your risk of a heart attack or stroke without the need for multiple prescription drugs most conventional doctors recommend. Hundreds of thousands of people have taken this message seriously and achieved immense improvement in their health. Prescription medicines can be a wise decision – even life saving at times – but not if chosen in ignorance of their superior alternatives. The main purpose of this book is to turn the spotlight of your attention on the natural measures of controlling the abnormal blood triglyceride levels - a common lipid metabolism disorder in the Western nations. Before you can master an enemy though, you must know its name, its habits, and where and how to attack it. As you read, analyze yourself carefully and determine which, if any, of the underlying causes of elevated blood triglycerides may apply to you. Sometimes it may be relatively easy to locate them but very difficult to eliminate, especially from your lifestyle. I am certain that by sharing information in this book, it will help you make up your mind without being dominated by so common nowadays physicians’ assumption of authority." I was so happy to be able to find this book (second, revised and expanded edition!!!). My God, I think I will go to my Doctor and ask him why he didn't explain to me why I have high triglycerides. I was wrong thinking it is too much of fat food only. Now, I'm reading this book and learning so much and, finally, know more why my cholesterol is 270 and triglycerides are 575. I'm so blessed to read this book and learn more about. 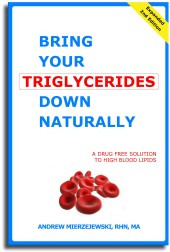 There are only a few, literally, books on blood triglycerides for both the lay persons and health practitioners. This one, Canadian, definitely, is the most comprehensive and up-to-date. First of all, it is the work of someone who speaks from experience. Therefore, all of the information is very practical and easy to understand and remember. When you read that "high triglycerides are bad for you," the author does not stop there. He does his best to let you know what can be done about it. Or more precisely, what YOU can do about it. Indeed, this book clears lots of existing confusion on triglycerides (and the other blood fats) by telling you things your doctor is not going even mention to you. Of course, you may find some of the more demanding recommendations in this book uncomfortable, but you know that they have been made keeping your health and well-being in mind. And that counts. It is a highly recommended reading. because we find it the most beneficial to your lipid health in its category. Confidentiality Statement: Full of Health Inc. is responsible for the personal information under its control and assures the security of that information, both technologically and procedurally. Information about individuals, such as name, address, telephone number, email, credit card information, and screen name, is NEVER sold, rented, or otherwise disclosed to third parties. CURRENCY CALCULATOR: If you would like to calculate the price in your currency, you can use the XE.com Personal Currency Assistant™, using prices quoted in US funds only. Please note that the XE.com Personal Currency Assistant link is only provided as a courtesy. Conversion rates are subject to change, so your result should only be viewed as an estimate. At Full of Health, Inc. we assure the security of your personal information, both technologically and procedurally. To protect every interaction you have with us, we use industry-standard SSL (secure socket layer) technology. By clicking on any of the "Add to Cart" buttons, you are NOT obliged to purchase anything online. Even if you complete a transaction, you can always CANCEL it within 24 hours. Leave your name, phone number, and the best time to call you. Within one hour, we will get back to you to take your order. Prolonged stress is one of the main causes of elevated blood triglycerides. A new study has found the evidence that psychological, mental stress causes triglycerides to stay in the bloodstream longer contributing to cardiovascular health problems (Psychophysiology, 2002: 39; 80-85). The stress factor, however, has been repeatedly underestimated with regards to elevated blood lipids (fats). please enter your FULL NAME, then click on the "$" button below. NOTE: The discount applies to qualified VirtualCART® orders only. © 2001-2008 Reduce Triglycerides.com: Lowering High Triglycerides Naturally. Triglyceride Reduction TGs Formula: A Drug-Free Approach to Elevated Blood Triglycerides. All rights reserved worldwide. This document may not be copied in part or full without express written permission from the publisher. The information on high triglycerides and nutrition provided herein is a general overview on this topic and may not apply to everyone, therefore, it should not be used for diagnosis or treatment of any medical condition. While reasonable effort has been made to ensure the accuracy of the information on reducing elevated triglycerides, Full of Health, Inc. assumes no responsibility for errors or omissions, or for damages resulting from use of the high triglyceride information herein.